There are several reasons why your garage door might cease to work. Knowing some of the common issues to troubleshoot can help a lot in determining next steps and what to do. Our technicians explain more below. It goes without saying that garage door transmitters require power to work. So, if your opener transmitter battery is dead, it'll become impossible to prompt the door to open or close. If the transmitter doesn’t work, don’t worry. It most likely needs a battery change or a motor gear replacement. Modern overhead garage doors come with a unique safety measure to detect anything or anyone in the path of the door. This comes in the form of two photo eyes on either side of the door which transmit an invisible beam. If there is something (or someone) in the path of the door, the beam will break, preventing the door from closing. Sometimes, however, the garage door may not close when you attempt to shut it. You should first check to see if dirt might be obscuring the beam - you can clean the sensors gently with a lint-free cloth. If the door still doesn’t close, the photo eyes may be misaligned. Our professionals can check the alignment of the photo eyes and rectify this problem in no time. If your garage door tracks are misaligned, it can be dangerous to operate the door. If you notice the metal tracks are bent or there is a gap between the rail and rollers, you may need to call a professional to realign the garage door tracks. However, if they're badly damaged, you will probably have to replace them. 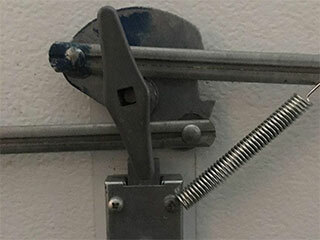 Whatever you do, you shouldn't attempt to change the springs yourself - this can be dangerous. Call our professionals instead, safety is always the best option!